Tony Ralph, the director of ad technology at Netflix, delivered one of the best talks at MarTech in San Francisco earlier this year. It’s truly a “graduate level” discussion about how Netflix’s adtech/martech team developed a build-and-buy strategy for their own technology stack for bringing programmatic advertising in-house. While not every marketing team has access to the level of engineering talent that Netflix has, Tony makes a compelling case for businesses to internally develop customized marketing technology solutions. But as Tony also explains, you certainly don’t have to build everything yourself. By choosing marketing technology vendors that provide full APIs, Netflix was able to leverage off-the-shelf technology and then integrate them into their own vision of the perfect marketing stack. Interested in attending a conference that discusses marketing technology at this level? If you’re based in Europe, consider joining us at MarTech Europe in London, October 20-21. Great insight, Shaun. Thanks. I used to work at Netflix here in Beverly Hills (ad sales support – you may recall they used to have banner ads on their site a few years back). I was floored by the intelligence there, especially when I visited their HQ. Don’t know what happened with Kwikster, mostly bad publicity handling — and my friend and now CEO of Tubular Labs (where I have also worked), Rob Gabel, was part of the detritus of that fiasco, but I’m so glad to see Hastings, Sarandos, et al have righted the boat and are now at full sail. Always one of my favorite disruptors, and still is. “Why wouldn’t you want to [build]?” Great to see people ask that question. This approach is the only way to get what your business needs. 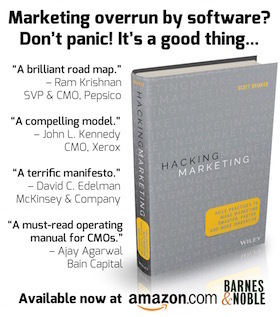 In martech, it seems so many products work well for the textbook company with one product and a narrow target market. Most of us don’t have that textbook case … there are legacy systems, data all over the place, multiple product lines talking to the same target markets, and so on. So don’t shy away from investing to develop what you need. While not everyone can afford the dev bench of a Netflix, there are agencies that can fill the gap. Scott, I agree with you wholeheartedly around the use of off-the-shelf technologies when it comes to looking at the build vs. buy paradigm. I’ve been in many organizations where too often the decision is made to simply build from scratch OR go completely with a vendor. The truth is, as you know, there’s value in looking at opportunities to potentially piece together some technologies that are really good at what they do and then focus the rest on other vendors or in-house development. I wanted to applaud this reasoned approach and look forward to your future articles!